For first-timers, taking the dog on the Brittany Ferries’ crossing from Spain was a bit overwhelming. Having got the hang of it however we’re keen to give it another go. Too much for first-timers but happy to have another go. Cap Finistere, one of three Brittany Ferries boats with pet-friendly cabins. It’s immediately clear why most ferry operators shy away from allowing dogs up on deck. Apart from shutting off precious space to regular passengers, concentrating canine waste products in one small area is just revolting for all concerned. If the pools of pee, or piles of poo don’t get you the eye-watering smell of disinfectant surely will. 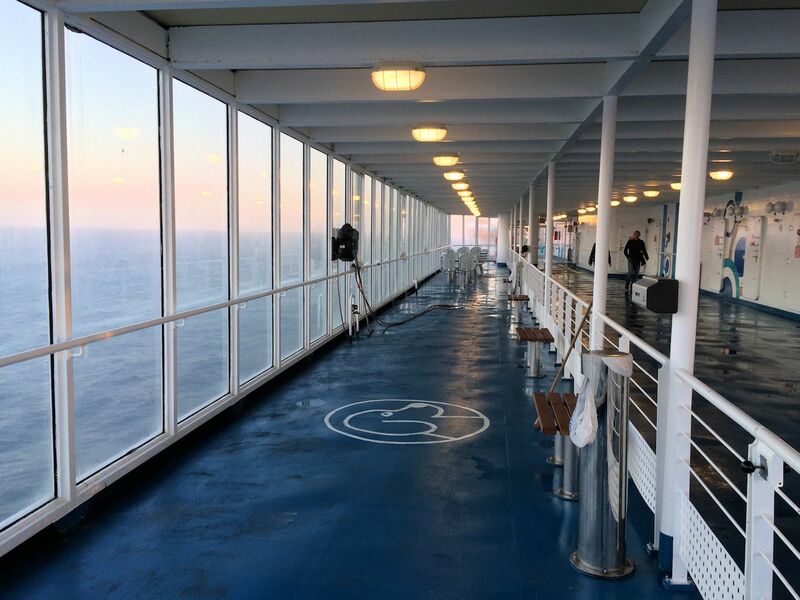 Confronted with the glassed-in stretch of ‘promenade deck’ reserved for dogs – it’s obviously vital this area is operational whatever the weather conditions – our Labrador didn’t know what to do at first, and neither did his owner. Thankfully the other owners, many of whom use this service on a regular basis, were happy to show us the ropes. ’Make sure he goes as close to the hose as possible,’ said one woman as mine strained in the opposite direction. All this was perfectly predictable had we stopped to think about it. But the only part of taking the dog on holiday we were focused on was getting him in and out of the country. Taking him out via Eurotunnel was easy, too easy maybe. There were no checks whatsoever; we didn’t even need to show his passport, much less demonstrate he’d had rabies jabs. Consequently we weren’t totally confident his paperwork was in order for the way back. It was hugely helpful then when Brittany Ferries sent us a text a couple of days out to say the dog needed ‘a tapeworm treatment between one and five days before he was due back in the UK and that the vet should fill in all the details including the time, date, product used plus the vet’s official stamp and a signature’. Our hotel pointed us in the direction of the local airport vet who efficiently completed the paperwork for €60. In the end it took check-in at Santander ferry port exactly ten seconds to examine our documents and hand them back with a reassuring ‘everything is fine’. The idea had been to settle the pooch in our ‘pet-friendly cabin’ before making a break for Brittany Ferries’ well-regarded on-board dining facilities. If there’s one thing overnight sailings are good for it’s a proper dinner with copious amounts of alcohol. Not driving until late the next day means being able to indulge in a way you normally can’t on a driving holiday. Brittany Ferries’ restaurants are said to be the best in the business. But once on-board we were told the dog would have to stay in the car until all the other pets were on the ship. They would then be brought up to the cabins in one go, supervised by Brittany Ferries’ staff. Since it took almost two hours to load, and we were among the first to board, the dog was in the car for longer than an entire Dover-Calais sailing. This was disappointing since we’d booked with Brittany Ferries because we understood the dog wouldn’t have to stay in the car on his own. By the time we were all in the cabin the restaurant tables had gone (complicated on this occasion by a private party which block-booked the early sitting). Instead we dined on beef stew from the distinctly insalubrious café on the top deck with wine from a plastic beaker and a can of lager. Not too bad actually or – at €26 all in – too expensive either but hardly the slap-up final night celebration we’d been looking forward to. The dog enjoyed it though. Waking up the next morning the immediate worry was how to keep our active, seven stone Labrador occupied for the remaining twelve hours of the sailing. But breakfast, lunch and dinner, regular visits to the poo-deck and an afternoon kip all-round soaked up the time easily enough. Cabin fever was never an issue though we did eye the rear sun deck enviously. Considering the fine late September weather it would have been great to chill out staring at the waves like the other passengers – whale and dolphin spotting – but it was off-limits to dogs. After all that, would we use this service again? More than likely. In the immediate aftermath we swore never again. After a two week full-on driving holiday, coping with the process as first timers was a bit much. Then there’s the inescapable fact that, since our last stop before the ferry was just over the French border in Biarritz – from where it’s perfectly possible to drive to Calais in a day – it would have been quicker and cheaper to drive home (considering the 24 hour sailing cost £595). A couple of weeks later, with time to recover, we look back much more fondly. 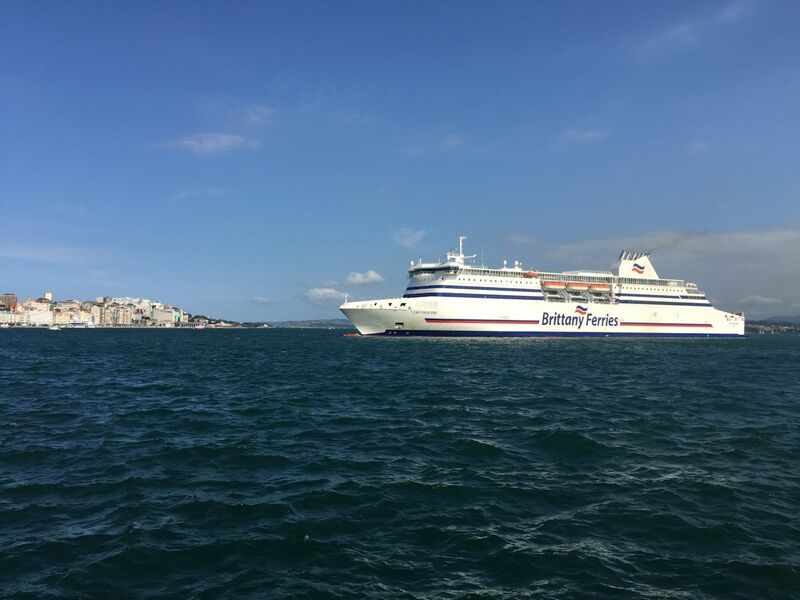 The benefits of the enforced rest on an overnight ferry cannot be overestimated, especially at the end of a long trip with the return to work looming. Had we boarded later, booked a restaurant table in advance, and not worn flip-flops the first time on the poo-deck, our experience would have been radically different. For: a good break on a very long drive. ‘Pet-friendly cabins’ means you stay with your pet for the trip, for most of the time. Reliable information takes the stress out of bringing your pet in and out of the country. Against: not cheap. Your pet can still be stuck in the car for a considerable time. Limited exercise and toileting areas. 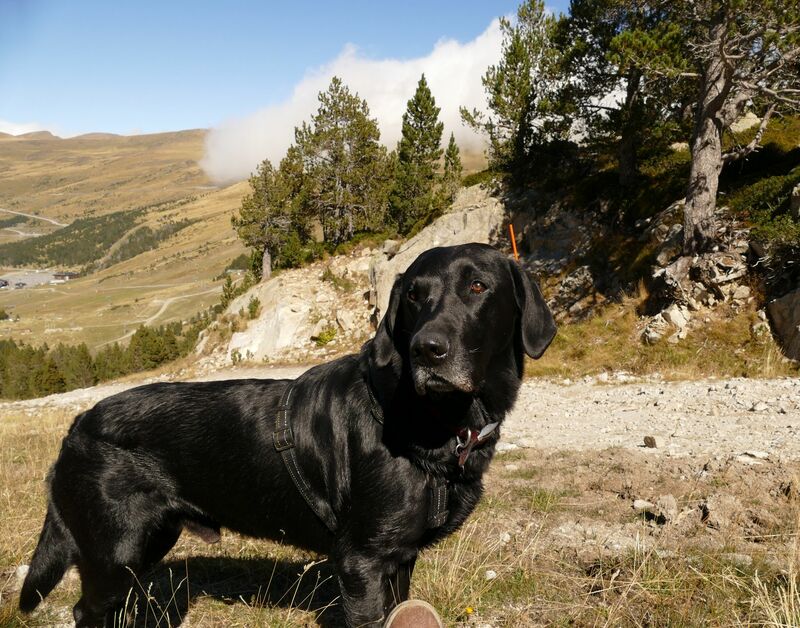 Limited availability of pet-friendly cabins. The Poo-Deck. A hose on a reel, free poo bags and a brush to help clean up after your pet. The ‘pet-friendly cabins’ are handily located one deck below. Turn up early at the Santander ferry terminal and leave the car in a secure area while you explore the nearby, not-unattractive city centre. Handy to give the dog a run before the long crossing. 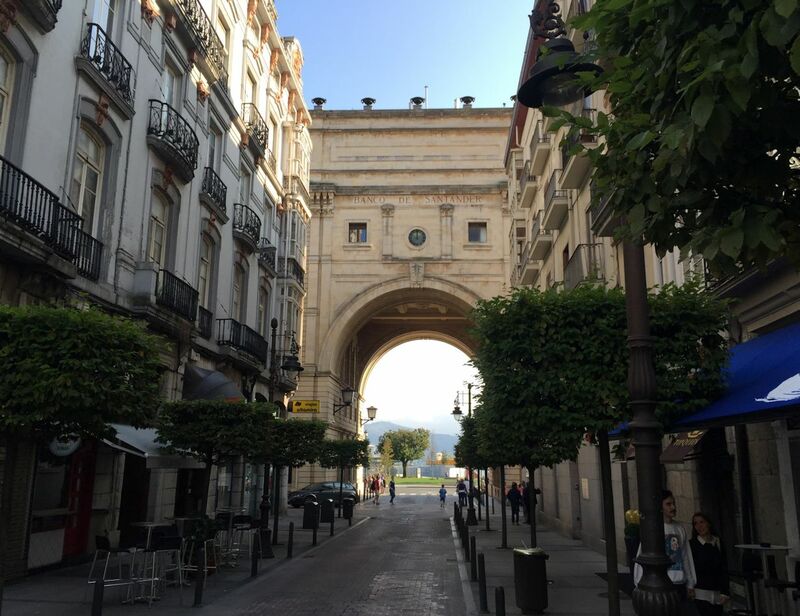 Santander is, not surprisingly, the original home of Santander bank. Whatever indignities were involved early on during the ferry crossing, it was a price worth paying for being able to take the dog on his first ever foreign holiday (and avoid too-long days in the car). Here in the Pyrenees above Grau Roig, Andorra.